Emancipation & Liberation » STUC AND ITUC (NORTHERN COMMITTEE) DEMONSTRATIONS ON OCTOBER 18th. STUC AND ITUC (NORTHERN COMMITTEE) DEMONSTRATIONS ON OCTOBER 18th. 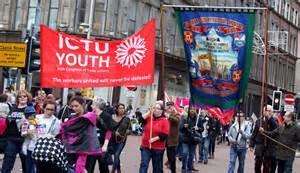 On October 18th the TUC, STUC and ITUC (Northern Committee) held demonstrations to protest against austerity. Trade Unionists For Independence (East Coast) distributed the leaflet below at the STUC rally, It’s Time to Create A Just Scotland, held in Glasgow on Saturday, October 18th. It was attended by 3500 trade unionists. Socialist Democracy (Ireland) wrote the second piece about the demonstration in Belfast. We faced the biggest ruling class offensive, backed by the UK state, since the Miners’ Strike. Only this time it brought together a combined Tory/Lib-Dem/Labour Better Together ‘No’ alliance, UKIP, the Orange Order, other Loyalists, British fascists, the BBC, the Pope and the Free Presbyterian Church, and the USA and China! Yet we still won 45% of the vote, and badly rattled the British ruling class in the last two weeks before September 18th. Cameron only conceded the referendum back in 2012 because he thought the prospect of any alternative to the ‘Westminster way’ would be trounced – “There is no alternative”. We showed that ‘Another Scotland is possible’. Since September 18th the mood of anger and defiance has continued. So where was the official trade union movement during this popular struggle for democracy? Trade unions have been quite happy to have conference resolutions and stalls providing solidarity to the struggle for democracy in Apartheid South Africa, or against Israeli occupation of Palestine, and quite right too. But what about the need for real democracy in Scotland? Most unions did not organise proper debates, although UNISON allowed some branches to invite speakers from both ‘Yes’ and ‘No’ camps without taking any decisions. Whilst too embarrassed to openly support a ‘No’ campaign led by the Tories, these unions, especially UNITE, still intend to give millions of pounds of members’ money to a Labour Party pledged to continue Cameron’s war, Osborne’s public spending cuts, and Duncan-Smith’s welfare cap. The CWU, nationally, shamefully placed a motion before their UK wide conference recommending a ‘No’ vote. They used statistics gathered a year before the referendum date to justify their stance. Nobody needs reminding that the gap between the ‘Yes’ and ‘No’ camp at that stage was anywhere between 25-27%. Their blind allegiance to UK Labour and their participation in ‘Project Fear’ saw many of their members in Scotland resign from membership and greatly damaged the reputation of a previously left of centre Union. However, the GMBU and USDAW went even further and publicly signed up to the ‘No’ camp, without any pretence of consultation with their members. Their leaders took orders directly from a Labour Party that has attacked their members’ jobs, pay and conditions and has not the slightest intention of restoring trade union rights. Two unions did organise a proper debate where decisions were made. In the PCS there was virtually no support for ‘No’. A majority, after a full conference discussion, opted for a neutral stance instead of the other contending option, which was for ‘Yes’. 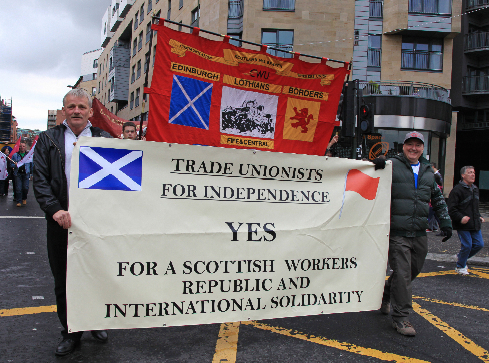 The RMT left it to their Scottish members to make a decision and they backed a ‘Yes’ vote. There was no official debate in the EIS, which decided to remain neutral, but Annie McCrae, standing on a combined Scottish Federation of Socialist Teachers and Radical Independence Campaign ticket received 49% of the vote in the Vice-Presidential election. What the PCS, RMT and EIS have in common is they are not affiliated to the Labour Party. The Labour Party does not represent our interests. This is why we need to democratise every trade union’s political funds. This means disaffiliating from Labour and placing these funds under members’ control. We need to be able to campaign over every issue that affects workers locally, nationally and internationally. Furthermore, it has become very clear that the existing UK state represents a fundamental obstacle to working class interests. We need to ensure that the trade unions fully engage with the democratic struggle for Scottish self-determination. This was not defeated on September 18th, but merely deferred. A “walk in the park” in trade union circles refers to a demonstration held to establish that the movement has a campaign and to satisfy the more active members. There is however no movement towards a set goal. The organisers carefully avoided explaining why a demonstration was thought more likely to achieve this miraculous change in the living standards of the working class rather than the traditional method of withdrawing their labour or why a number of unions had called off strike action just days before. Instead they employed another technique called “boo hoo.” This involves speaker after speaker listing the very genuine suffering of their members. The implication is that if the government and employers understood the terrible effect of austerity they would change their minds and that someone, somewhere, should do something. Of course the capitalists understand very well the results of their actions and no amount of boo hoo will divert them. What we are seeing is an existential crisis of the Trade Unions themselves. The situation in Belfast is even worse. Having dismissed the revolt against partition and British rule as sectarian the unions embraced with fervour the sectarian settlement sharing out corruption in Stormont and their central tactic has been constant lobbying of politicians there. Now even that illusion of action has gone. Stormont is in meltdown, the Unionists demand more sectarian privilege and Sinn Fein have dropped the left mask to bring forward an austerity budget. The small trade union march trailed past taunts by semi-fascist Loyalist demonstrators who could have been cleared from the streets by a handful of genuine radicals. Interviewed as the austerity details, involving the loss of thousands of public sector jobs, were announced, Belfast Trades Council leader and leading Communist Party member Brian Campfield remarked with a shrug that that was the way things would go for several years unless the politicians changed their minds. In both Britain and the North the Trade Union agenda is to dance in the cracks and soften the edges of austerity. As supporters of the capitalist system they were bound to take this option. The task of socialists is to put forward a real alternative. In the North a starting point would be to abolish a Stormont administration that is clearly incompetent and whose main function is to administer and maintain the sectarian division of the Irish working class.